“Spaghetti” cabinets and other symptoms of ill-considered cabling make it more difficult to complete equipment installations, troubleshooting, and maintenance. They can create an unsafe operating environment for your equipment by restricting airflow to racks, trapping dust, keeping cables warm, and making it impossible to understand at a glance how your devices are connected. Bad cable management practices can even hinder modern data center environments from adapting to new technologies like IoT and big data, provisioning IT resources on demand to support business innovation, and utilizing data center capacity to promote scalability, efficiency, and cost effectiveness. That’s why we’ve put together a new eBook to help data center managers, operators, cable installers, and anyone else involved in data center cabling. 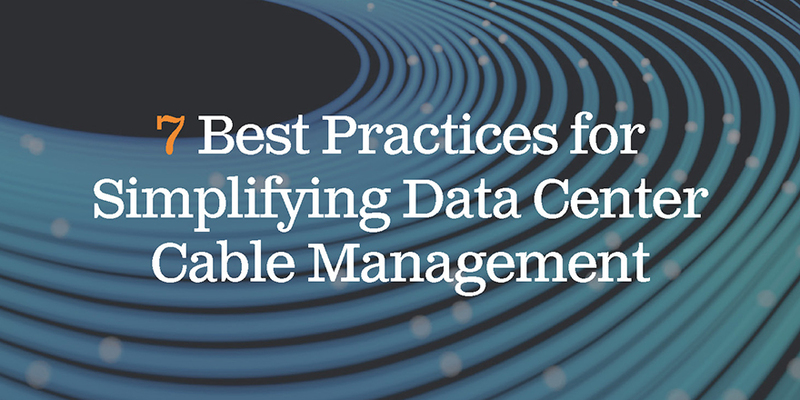 Titled “7 Best Practices for Simplifying Data Center Management,” our eBook compiles seven key insights to help reduce the complexity of cable management, along with real-world tips from our experts. For example, when designing new cabling infrastructure, you can use Data Center Infrastructure Management (DCIM) software to virtually design the new network and all the connectivity that will be needed before physically building the infrastructure. Another great tip is to measure the length of cable you need before installation. With DCIM software, you can estimate the lengths of your cable runs to save time and resources. A comprehensive DCIM solution will allow you to measure the distances between cabinets on the floor map as well as the near- and far-end vertical heights for additional accuracy. Are you involved with the cable management at your data center? Download our eBook today for information that can help make it faster and easier for you and your network team to efficiently troubleshoot and maintain your data center environment.